Calcualtion, analysis and design of earthquake (seismic) and wind forces. Seismic repair and/or strengthening. Design for compliance with applicable criteria meet strength and stiffness requirements, increase ductility, mitigate irregularities and discontinuities, and increase local and global stability. Professional engineering supervision of the construction of engineering structures: periodic observation of materials and completed work to determine general compliance with plans, specifications, and design and planning concepts for the purpose of securing compliance with specifications and design for any such work. Development of feasibility options and constructible details considering the existing conditions of the structure. Upgrade exising structure to meet current code requirements or the applicable level of compliance. Review construction documents, Conduct field observations, investigate, and document existing conditions by field observation and measurement. Review, request, or specify tests for material strengths and properties [e.g., tension, compression, shear test(s)]. Evaluate the structure to determine seismic deficiencies, compliance with applicable design criteria (vertical and horizontal lateral force resisting systems and elements). Determine seismic hazard mitigation requirements. 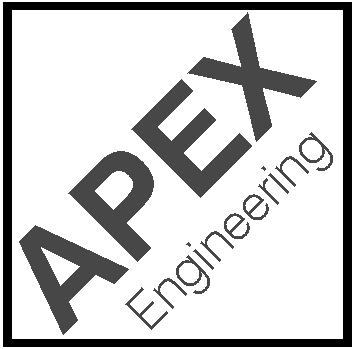 APEX Engineering: a full service structural and architectural engineering company.